My girls are hands on learners! Give them something to color and put together and they will happily work for hours with no complaints. 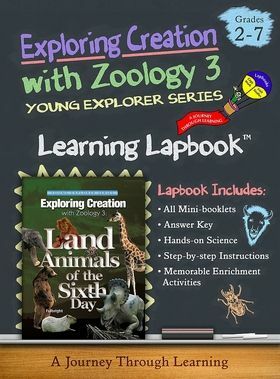 So when we were offered to review the Apologia Land Animals of the Sixth Day Lapbook from A Journey Through Learning Lapbooks I knew it would be a perfect fit for Montana. She has been working through this science curriculum since last year in addition to her normal science rotation because she loves animals. This lapbook is just one of the many Apologia Elementary titles available at the Apologia Curriculum page so be sure to check them out if you are working through any of the other Apologia titles. With over 160 pages this lapbook is choke full of hands-on learning that correspondes with the textbook. The lapbook comes in a PDF file with both color and black and white versions. Since I utilize an awesome printing service with my printer, I can print in color without worrying about ink costs. These are geared for students in grades 2-7 and go together with the 14 lessons that accompany the textbook. Words like “hamburger folds” and “hotdog folds” might be confusing if you have never constructed a lapbook but thorough Instructions are given in the beginning of the PDF file if this is your first time assembling one. The Lapbook folder when take you through each of the 14 lessons in the book and includes mini books on specific topics in each lesson. The lapbook feature copywork, diagrams, flaps, wheels and more! Montana thought she was just coloring and cutting and pasting but the knowledge is sticking with one dab of glue at a time. The best part is everything is planned for you! If you’re a busy mom like me, this is a big plus to my day. I simply print and give to my daughter and she checks in if and when she needs help. A full answer key is also provided at the end in case you get truly stumped. Click the banner below to read the reviews!